So you’re after a fun night out, and watching stand-up comedy in Melbourne is at the top of the list. Well, you’re in luck, because Melbourne, and its neighbouring inner suburbs, has some of the best comedy clubs, pubs and rooms in the world! Really! Lonely Planet writer, Tim Richards, ranks North Melbourne’s The Comic’s Lounge as the world’s number 7, and it’s no surprise given the the Melbourne’s comedy festival is the largest in Australia, and the third largest in the world! So where to go when you’re spoiled for choice? Here’s our list of Melbourne comedy rooms, compiled by the the School of Hard Knock Knocks alumni. You won’t always get an A-list comedian headlining at Stand-up in the Attik, but you’ll always have a laugh, since the night typically has five to six comedians on the ticket. And being a free event, this is a great after dinner show to enjoy that last ‘one for the road’ – particularly if you have a slow Friday. The Basement Comedy Club, as the name suggests, is in the basement, and in the same venue as . Not that that affects the quality of comedy. It’s just as good above as it was below ground level. In fact, Basement Comedy has some of the best established and new Australian comedians on the circuit and is an excellent alternative to The Comic’s Lounge on a Saturday. Catfish comedy is a surprising little comedy room, which attracts some big names. One week you’ll have Edinburgh Fringe Comedy Award winner, and the next you’ll have a TV celebrity comedian – both supported by an equally impressive number of lesser known, but no less funny, comedians. Pints of beer at $7 makes for an extra enjoyable night out too. Woo-hoo! Another great CBD comedy room. Each Friday, you’ll typically get a relatively well known headliner, and then a selection of equally funny, but less well known, newer acts. This is another venue that is competing against the larger and more established Comic’s Lounge. As mentioned above, The Comic’s Lounge is one of the most successful comedy clubs in Australia. For an up and coming comedian it’s the comedy Mecca, and performing with one’s name blazoned behind them as they perform is a significant feather in a comedian’s cap. Also, due to the room’s popularity, they have the pic of top comedians, both local and international. This is another surprising comedy find, in the heart of Melbourne’s CBD, and one that draws big names. This is made all the more remarkable, since it is totally free! Comedian Dave O’Neil runs this weekly room (when he’s not making TV shows, performing in Spicks and Specks reunion shows, or gigging around the country). As can be expected from a highly respected comedy veteran, the line up is always top-notch and worth far more than the very, very reasonable price of $12. Produced by comedy siblings, who are passionate about comedy, First Friday Comedy is a great little room that has quality acts and the occasional headliner. As the name suggests, the show is on the first Friday of the month, so don’t turn up any other Friday. Guerilla is both a curated and open mic room. By curated, we mean that the line up of comedians is decided ahead of time. Guerilla Comedy’s Facebook Page announces the selected comedians, a week ahead of the event, and most of the curated comedians performing have been doing comedy for at least two years, so their comedy is more refined than a fresh open mic-er. Kings of Comedy is the new kid on the block, and is quickly becoming a popular Friday destination in Melbourne’s CBD. The club includes ‘features’ and ‘headlines’, and we’re not actually sure of the difference, but typically both acts are excellent and semi-famous at the very least. Punchlines Comedy Club is the younger sibling of the School of Hard Knock Knocks, a stand-up comedy school that develops new comedians. Punchlines brands itself as the ‘Best of the School of Hard Knock Knocks plus guest comedians’, meaning you’ll always have a top headliner, and a few surprises. The room seats over 100, tables can be reserved, and meals can be eaten during the show. The comedy room is separate from the public downstairs, and there’s also a bar, so you’ll never miss out on a punchline while you’re ordering your beer. Traditionally, Monday can be a dead night for comedy, which is why Quick Bites is an awesome ‘up yours’ to tradition. You won’t usually find an A-list comedian on this ticket, but that’s not to say the line up isn’t funny. This is a great venue for an after work drink, to ease your way into the working week. The School of Hard Knock Knocks hosts a graduation performance on the last Thursday of the month, with newbie comedians performing alongside seasoned professionals. The audience is normally large – between 60 to 100 people – and full of friends and family of the new comedians, so every joke becomes just a little bit funnier. If you’re thinking of trying stand-up comedy yourself, then attending one of these shows will help ease you into the prospect of getting up on stage. In a Melbourne stand-up comedian’s journey, Comedy at Spleen is second only to performing at The Comic’s Lounge. While a free show, Spleen attracts some of the biggest names in comedy, who might not necessary be on the ticket, often turning up by surprise. The up and comers performing will also be on their best game, knowing that making a great impression at Spleen can boost a comedy career, or at the very least, ensure an invitation to return. If you’re a new comedian yourself, then getting along to Comedy at Spleen makes for good research. Oh, but do be prepared for a tight squeeze as an audience member as the bar is popular! “Too squishy for me but if you don’t mind feeling a bit sardine like the comedy as I said is great.” – Judy Stutz. One of the best nights of the week in comedy happens to be on a Thursday. The crew that run Basement Comedy (see above), run this room, only this time it’s upstairs…and on a Thursday. Some of the best names in Comedy perform, in this room which sits around 150, so it’s an intimate show, but well worth the $13 entry fee. 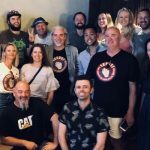 “The ear is the avenue to the heart,” said Voltaire, and every Sunday Club Voltaire Comedy is making North Melbourne a lovelier place with it’s curated and open mic night. This is a very relaxed venue, with new comedians trying new jokes, so don’t expect the same calibre of performance as, say, the Comic’s Lounge which is located around the corner. If you’ve got an interest in performing stand-up comedy, then Voltaire is a good gauge of up and coming comedians, particularly because you’ll see A LOT in one night.